Plant with a single attachment consisting of many multicellular filaments. Erect part ca. 7 mm tall, branched every 4-6(7) cells under a very narrow angle, axes more or less complanate. 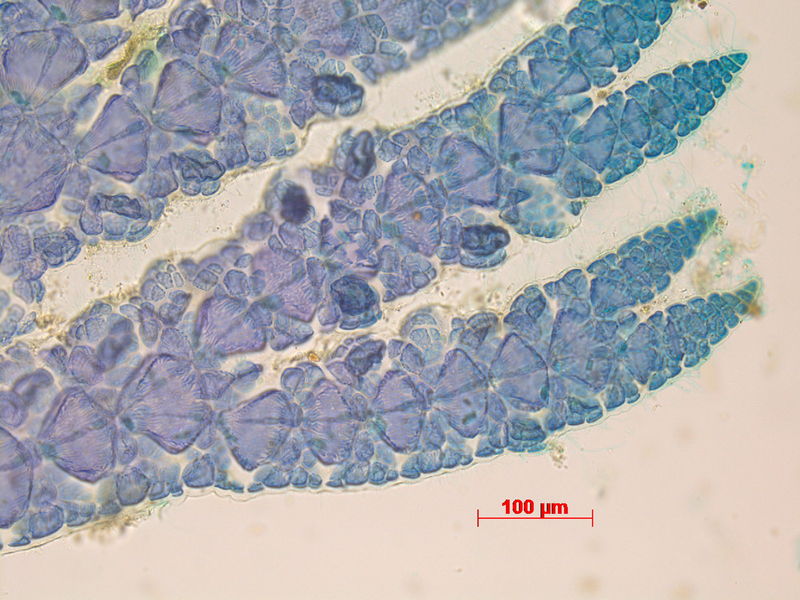 Apices not incurved, diameter of the thallus varying from 18 (apical cells) to over 200 µm, the segments much shorter than broad near the apices to about isodiametric in more basal parts. Segments with a prominent central cell, 7 or 8 periaxial cells, each with (up to) 2 acropetal and 2 basipetal corticating initials, often with very limited development of further cortication. Cortical bands often touching each other in the plane of branching of the plant, but leaving a large part of the central cell exposed in the plane perpendicular to it. 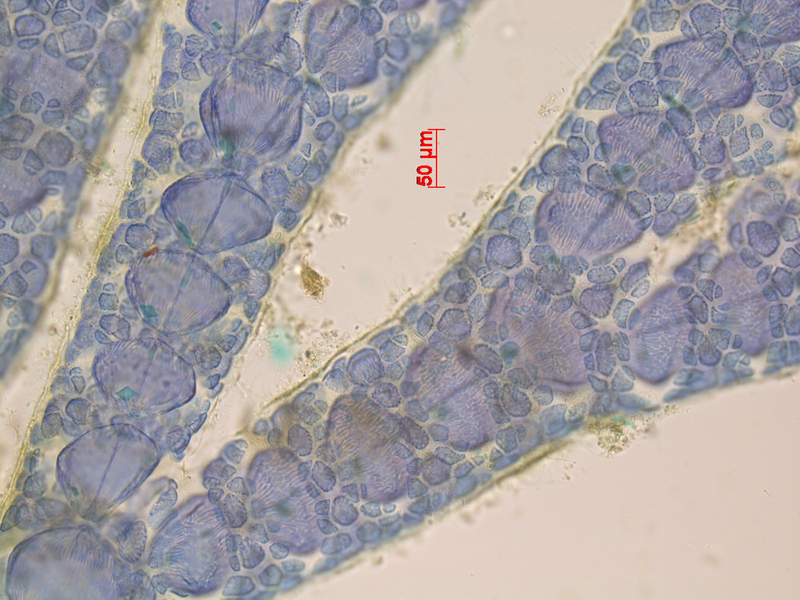 Tetrasporangia in a number of subterminal segments, only developing in the plane of branching, remaining enclosed in cortical tissue, final size probably some 50 µm in diameter (empty sporangia). Only recorded from a collection at Xora River, Transkei, at 16-20 m depth. Note: this is one of several Ceramium entities for which we have very limited material, and the affinities of which are unclear. Ceramiun graecum/lenticulare complex, with tetrasporangia. Stained slide. Ceramiun graecum/lenticulare complex, showing cell arrangement at nodes. Stained slide. 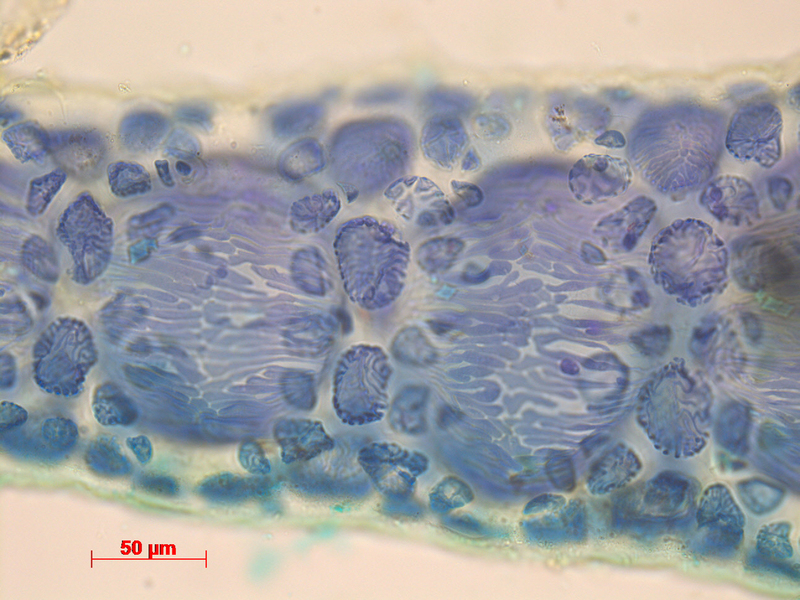 Ceramiun graecum/lenticulare complex, showing detail of cell arrangement at nodes. Stained slide.